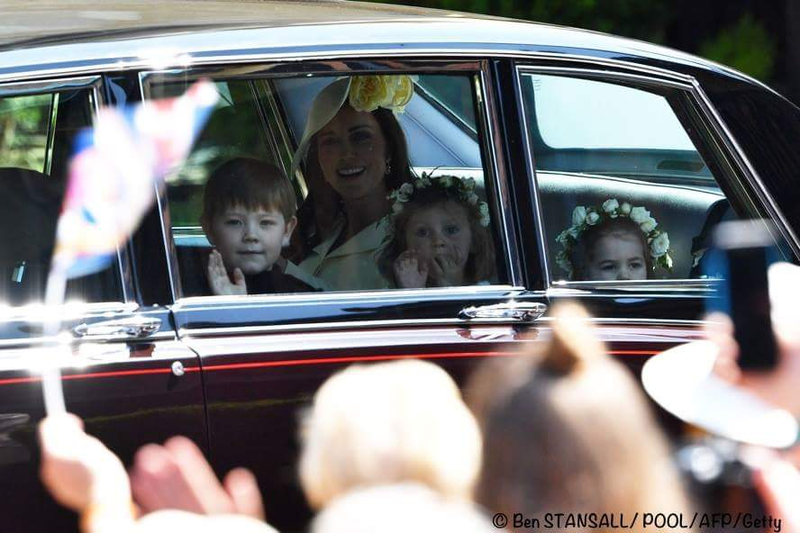 The Princess, along with the girls, is not shy and turns to wave at the adoring crowd outside the chapel. 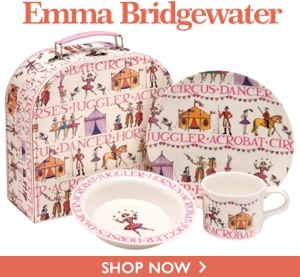 We can just see Prince George beyond Charlotte above on the stairs. 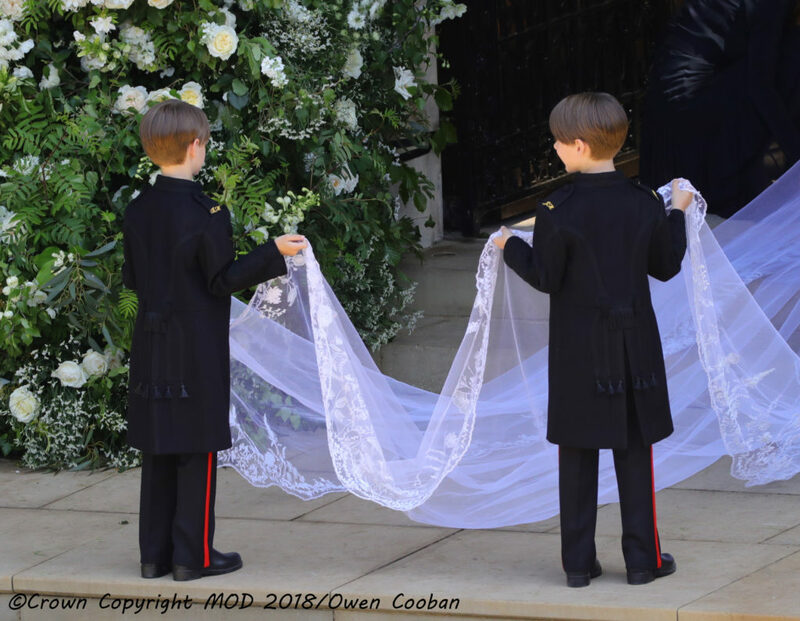 Below, twins Brian and John Mulroney hold the end of Meghan’s 16.5 foot train as she enters the chapel. 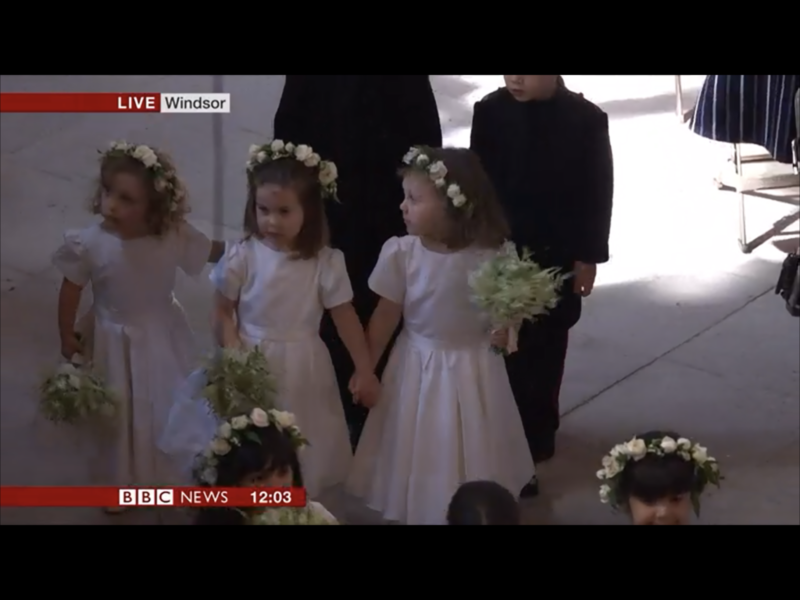 In the screenshots below from the BBC News we see the girls, Florence, Charlotte and Zalie and their bouquets that match the brides. 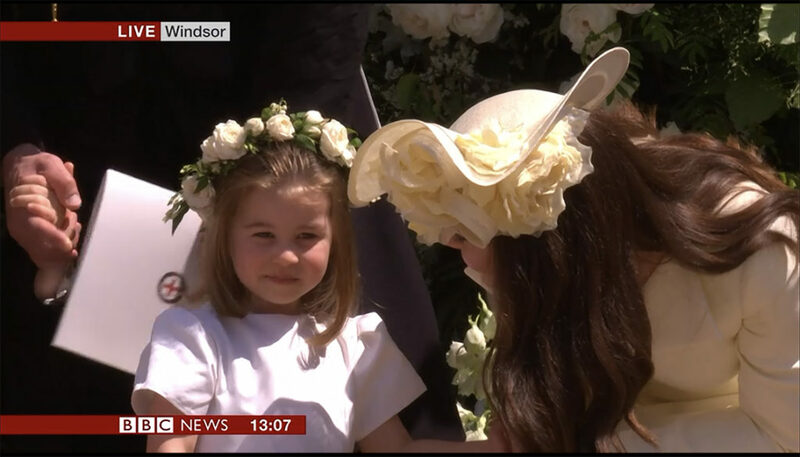 Kate and Charlotte outside after the ceremony. We now take a closer look at what the Pageboys and Bridesmaids wore. 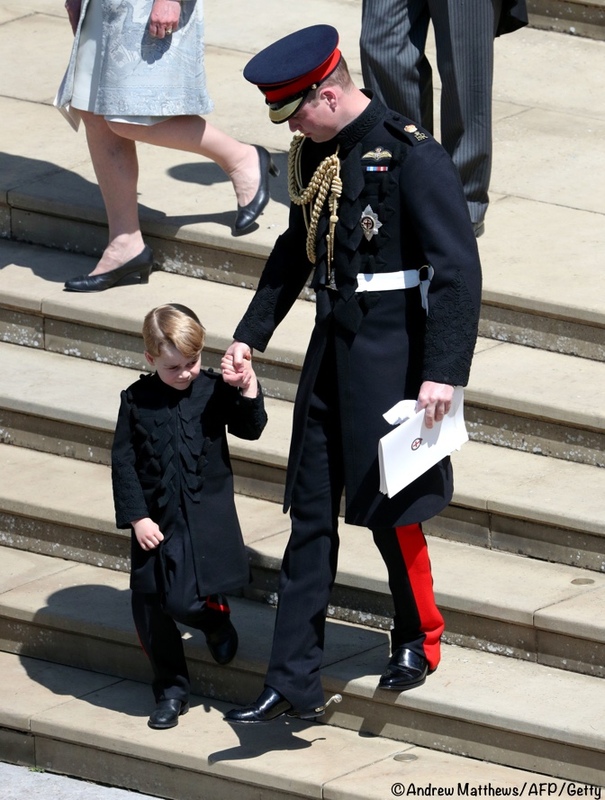 The page boys wore the Blues and Royals frockcoat, made to emulate the uniforms that Harry and William wore. The mini-uniforms were cut and made by tailor Dege & Skinner in Savile Row. 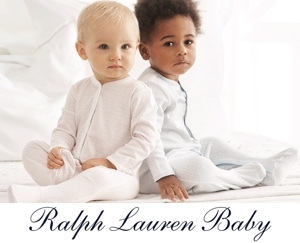 They were made from blue doeskin, a soft, medium-weight wool fabric with a short, soft nap; the boys initials were monogrammed on the shoulder straps. Below a close-up of the shoulder straps showing the monograms of Brian and John Mulroney. Each of the trousers are made from a blue/black wool with three-quarter scarlet stripes; they are fastened with a leather strap. But perhaps the most important thing about the trousers? They were full-length, George wasn’t in shorts! Thank you to Hannah for her comment pointing this out! 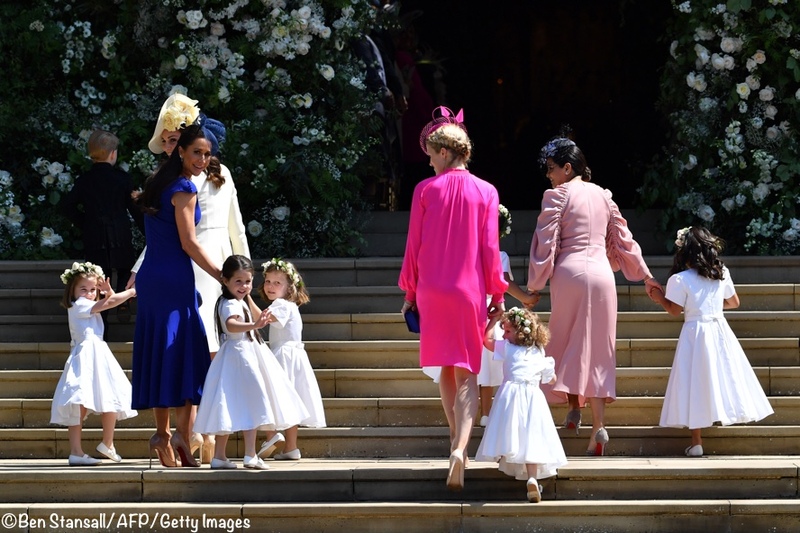 The six bridesmaids dresses were also designed by Meghan’s dress designer, Givenchy Haute Couture Atelier’s Clare Waight Keller. Each of the dresses is made of ivory silk Radzimir, a luxurious mid-weight sculptured silk fabric made in Italy. They feature short puff sleeves and high waists; they are hand-finished with a silk ribbon bow in the back. The dresses also include pockets and pleated skirts. The girls’ shoes are by Aquazzura, made in white leather and monogrammed with the wedding date and each of the girls’ initials on the sole of the shoe. Meghan gifted the shoes to each bridesmaid as a keepsake of the special day. Each bridesmaid wore a crown of flowers selected by Harry and Meghan. Their bouquets mimicked that of the bride’s. 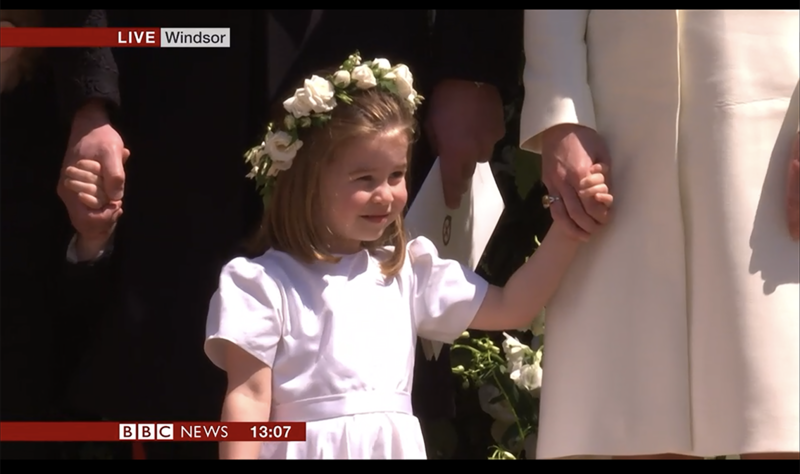 Both the floral crowns and bouquets were designed by florist Philippa Craddock. I am remembering an interview where Harry expressed dismay at some of the matching sailor outfits that Diana dressed he and William in. Perhaps he had some input on the more mature military outfits for the boys. Regarding the no socks or tights for the girls….Meghan is a California girl! I remember that interview as well, I wish I could recall where I saw it. hmm . . . no socks on the little girls, made this look way too casual for such a formal affair, (like the messy bun style). Any other wedding might be able to get away with this, but a royal wedding that will go down in the history fashion books, not so. That said, the children was darling, but the twin boys stole the show with their expressions of excitement! I usually comment on the “WhatKateWore” blog but don’t typically post here. I purposely came here after seeing close-ups of the little girls without their socks. I guess I was so focused on the bride and groom I hadn’t paid much attention to the kids. But I was very surprised to see the little girls with no socks. I wouldn’t think this proper for even a much more modest wedding and really am shocked to see it here. Did anyone else notice that George and Charlotte did not walk back down the aisle with the rest of the page boys and bridesmaids? They walked out with their parents behind Meghan’s mom, Charles and Camilla. Anyone know what’s up with that? I thought the boys looked like undertakers. 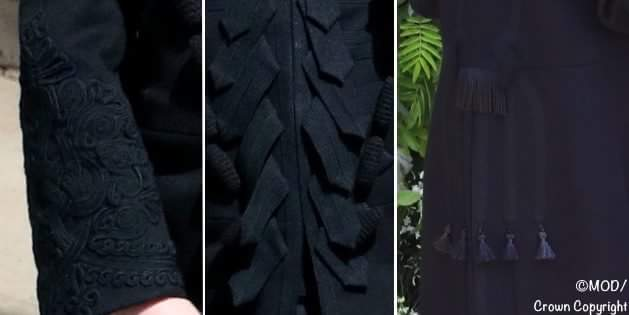 The intricacies of the coats did not get picked up on the tv or in the pictures very well and they just looked like dark black long coats. It was a very harsh contrast to the girl’s dresses. I don’t mind the simple girl’s dresses, but I did think they looked like they were not a complete outfit and then I realized it was because they didn’t have tights on. Here in AZ we rarely wear tights (too hot! ), but I was shocked at how it could complete an outfit and that I missed them on these little girls. Even with these “misses”, it was a beautiful wedding and I am sure everyone involved is extremely happy with how well it went! Socks. If no tights because of the heat, little girls wear socks. The kids looked adorable amd were all so well behaved!! (Way to go, parents! 😉) Ive watched the wedding probably a dozen times now and just realized that George is in long pants after reading this post haha. The whole wedding was lovely, I really enjoyed watching it from the states. 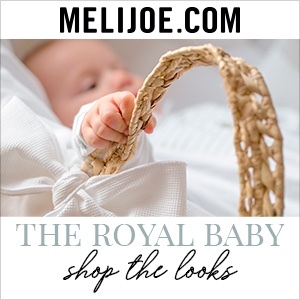 Wonderful outfits for the children, and something of a surprise with other royal weddings going for more by the way of frills and flounces. The bridesmaid dresses are simply sweet, being so full-skirted and pretty. The little shoes look oddly casual but adorable nonetheless. I was very taken with the pageboy outfits, though I did wonder if they might not have been a little warm. I wonder if George enjoyed being dressed more like his father. Kudos to Meghan to dress him in long pants at last! Curious to have the frills on the boys ‘ outfits and not the girls. Of course, I get it now. The casual touch on the bridesmaids’ footwear stems from the absence of socks. Thank you kind people for explaining it to me! I have a comment on Ivy Mulroney’s lack of a floral crown. My children were also in a wedding this weekend, and my daughter was supposed to wear a floral crown much like the bridesmaids in the royal wedding. She HATED it. She actually pulled it apart. Thankfully she waited until after she walked down the aisle, but only because we placed it on her head as she started to walk. If we had decorated her hair earlier in the morning, or she had to be seen before the wedding, she certainly would not have had flowers in her hair during the wedding. If Ivy had a similar reaction to her flowers, I imagine a lack of flowers was far preferable to a tantruming bridesmaid. Why did Ivy Mulroney not wear a flower wreath in her hair? She had flowers pinned back with her hair in the back but she stuck out not looking like the others. Was this her mother’s plan? All the children looked wonderful. The simplicity of the lovely bridesmaids dresses looked just right with Meghan’s wedding dress. The boys! Utterly charming in their gorgeous uniforms. And I love the monagrammed shoes as a gift! So special! The families of the bridesmaids treasure these special outfits and pack them away carefully as wonderful keepsakes. All in all the children looked adorable and were so natural. Well done! The children’s outfits were extremely disappointing and somewhat dull. The dresses the sweet little bridesmaids wore were so unimaginative. They could have been so lovely and sweet, but instead they looked very “un-special” as said above. They looked incomplete without tights and their shoes looked large and clumsy. The page boys uniforms appeared so dark on them. It seemed a little harsh next to all the white of the bridesmaids and bride. I much prefer the outfits from Pippa’s wedding last year. Those outfits were so beautiful and sweet . 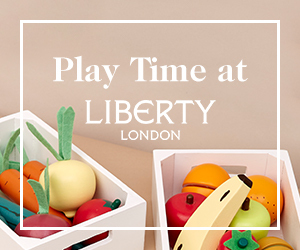 They showcased the best of designer British children’s fashion. I agree 100%. I also though the Dutchess of Sussex’s dress was too plain. 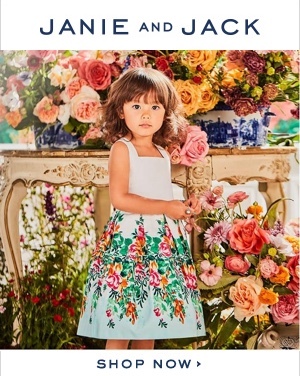 The children’s clothes in Pippa’s wedding were gorgeous. The children here were cute but not their clothes. I noticed this was the first time we saw Prince George in long trousers on an official occasion. That’s supposed tobe a big deal, isn’t it? No one mentioned it before! Do you think we’ll be seeing him in long pants more frequently from now on? He wore pants because the outfit was a mini military uniform. No military uniform includes shorts. I’m sure will still see him wearing shorts at other occasions for the next few years. The kids did look really cute. i love that the dresses have pockets. I would have preferred socks or tights on the girls. I like the dresses but would have gone with a bit less of a boxy look to the overall dress and sleeves, they ended up looking a bit like a nursing uniform. But overall everything was very sweet. I missed the origin of the groom’s uniform but I must say it looks funereal and not appropriate for the little boys. But tradition won the day I suppose. I agree the little girls’ dresses were dare I say frumpy. I think prettier dresses are available at retail stores. Oh well it was all lovely in the end. I adore Charlotte’s over the shoulder wave. I keep wondering why Ivy Mulroney isn’t wearing a floral wreath on her head like the other girls. Anyone have any idea? That’s a question several readers have had, and unfortunately, I don’t have a good answer. But I will look for some info and update the post if I discover anything. I loved the pageboys’ uniforms and really appreciate the close-up photos of some of the details. I’m not as fond of the outfits the girls wore. I think the bridesmaid dresses at Pippa’s wedding were far preferable. The length — especially with the no socks/tights look — seemed off to me; either shorter or longer would have looked better, in my opinion, with the shoes. 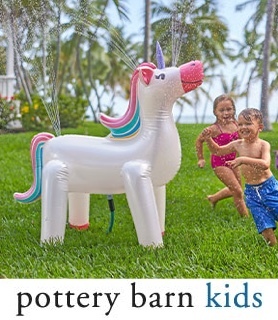 But it’s a bunch of adorable little kids — how much can anyone object to any part of it? I do wonder where they went during the ceremony itself — in the past, the attendants were on display throughout the ceremony, providing ample opportunity to observe the whole panoply of emotions felt by very young children who find themselves in a most unique situation. I think I prefer the focus to be on the couple being married. 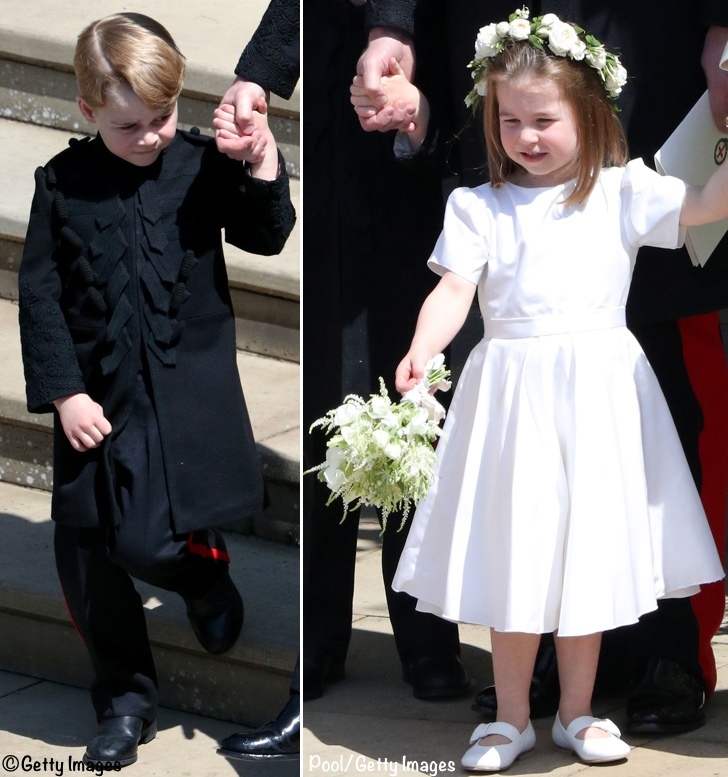 It worked well to have the kids go off to wherever they went after they walked down the aisle – Especially with George and Charlotte in the mix. The press and the public had very little chance to obsess over the two of them, keeping the focus on the bride and groom where it should be. I am sure there was a gaggle of nannies waiting for them wherever they went. Although I’m surprised that Brian and John Mulrooney didn’t sit with their parents, who somehow had the seats in front of Meghan’s mom. Disapppointed in the children’s outfits. The boys looked very severe and sombre and although I get the military theme, the look was not flattering on young children. The girl;s dresses had such potential to be lovely, but their plainness made them look as “un” special as was possible. This was a royal wedding, with access to top designers, seamstresses and budget. 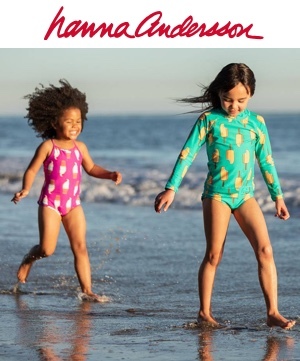 What better time to add some elements of amazement to the clothing of these precious children. I agree. Maybe they looked better in person, but the boys outfits didn’t photograph very well in the bright sun. It just looked like a black coat. The stripe on the pants was the only thing you could really make out easily. You have to look really hard to see the details that made them into a military uniform – Especially without the madals and decorations that were on William and Harry’s uniforms. 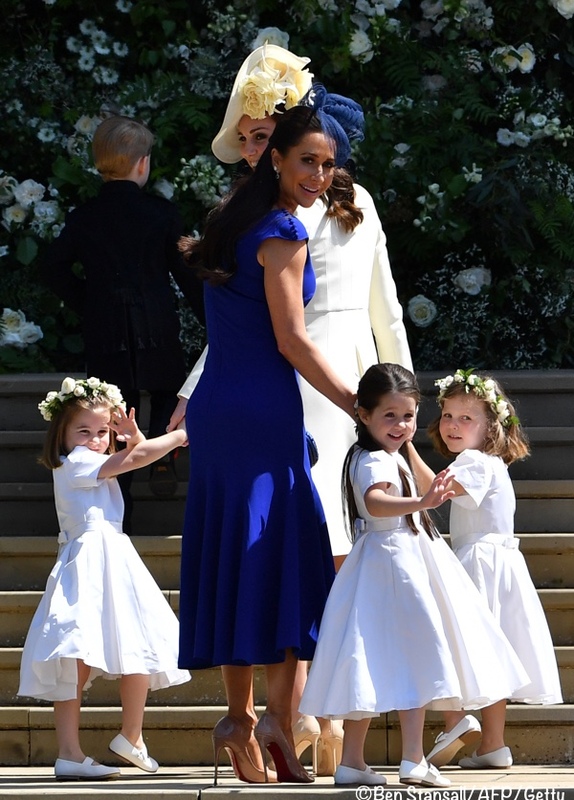 And I get that she was keeping with the minimalist theme for the girls dresses, but I don’t think it worked as well as it it did for Meghan’s dress. They looked like a plain white dress that also comes in 20 other colors on a website like the gap or L.L. Bean. I feel that it is strange to describe the shoes as a keepsake. What else is Meaghan going to do with 6 pairs of slightly worn shoes but give them to the girls to use? Although as they are monogrammed, the shoes will probably end up in a cupboard unable to be worn which I feel is a waste as they are very nice shoes & no doubt very expensive. That said, all the bridesmaids looked adorable! I suspect George and Charlotte’s outfits will be on show with the bride’s dress. I thought that was a strange kind of gift too. Usually it’s something like jewelry that you can wear again and again, or pass down to another child. Gen–I agree I thought the shoes being the gift was a little strange, though the monogramming detail is a thoughtful touch. Children outgrow shoes so quickly, and how are the shoes any more of the gift than the dresses themselves? I can’t imagine the mothers were footing the bill for their kids’ clothing and accessories for this wedding. A necklace, bracelet, or brooch would have made sense for the little girls and could be reworn on future occasions. However, my own mother saved the little white ballet shoes my sister and I wore as flower girls for our uncle’s wedding. It was sweet to see many years later how tiny our feet were–and how dark the soles became after only one event! Kids can be very obsessive about their shoes, I’m not sure why. 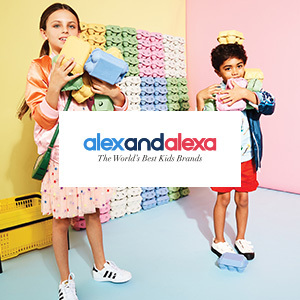 My daughter is six and I have a hard time donating the shoes she has outgrown because she keeps track of them (and asks about them if they go missing! ), especially the ones that are special occasion shoes. I’m pretty sure she would just die to have shoes with her initials on them and she would put them in her treasure box or on her shelf and talk about them for the next three years at least. I’ve met quite a few other small kids (both boys and girls) who are the same. My guess is the duchess is also acquainted with some children who have the same love affair with their shoes. The children looked adorable. By the way, I do believe the Mulroney boys’ names are John and Brian; Ben is their father’s name. Just a note that the Mulroney twins are Brian and John. Ben is their father.